Manage GitHub issues for repositories that you have commit access to. 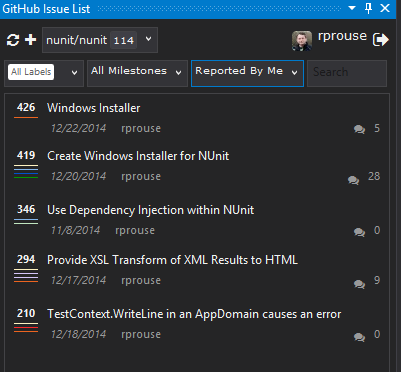 You can filter and view issues for a repository, edit issues, add comments and close issues. Access and manage GitHub issues for repositories that you have commit access to. You can filter and view issues for a repository, edit issues, add comments and close issue. This is a beta release, more features are coming. For more information, to report bugs or to suggest features, see this project onGitHub. GitHub changed their authentication API breaking previous versions of the extension. This version fixes authentication and adds other minor bug fixes. This release includes a number of bug fixes and improvements to searching for and filtering issues. This release includes a fix for not being able to create or update an issue without an Assignee. It also includes a number of bug fixes, code cleanup and enhancements. The settings have been changed, so you will need to log in again when you update to this release. We do not currently support GitHub's Two-Factor Authentication system. However, you can generate a Personal Access Token to log in to your GitHub account instead. Enter a description in the Token description field, like "Visual Studio token". Your new Personal Access token will be displayed. Copy this token, and enter it in the Token text box in the logon dialog. You can now log in as usual. If you ever want to revoke the token, visit the GitHub Applications settings page and click Delete next to the key you wish to remove.